Last night I was wandering around the grocery store, trying to beat the worst of the sudden torrential downpours that started while I was out. I was perusing the end cap of marked-down items; admittedly, things in this area are usually pretty strange. It's almost always odd spices and mixes that need to real explanation why they've been relegated to an often ignored little corner of the general merchandise area. But I still like to check it out, just in case there's a great find. I got a perfectly good jar of pumpkin pie spice for a quarter once! I invested a dollar hoping for the best, but bracing myself for the worst. You know how they say that things that sound too good to be true usually are? Here's a great example of that. To say that this tasted anything like caramel would be a stretch. The only thing caramel-like about it was the color, to tell the truth. It had the consistency of pudding, if pudding were made with water and this particular batch had also been watered down. There was the distinct aftertaste of artificial sweetener. Even before my Whole Foods challenge, I have tried to avoid x-free anything. I'd rather have less of something real than all I care to eat of something made with chemicals. And when it comes down to it, I usually choose fruit over even an all-natural prepackaged snack since I can make the most of my calories that way. Looking at the ingredient list for this dip was unbelievable. I'm not quite sure how there are egg whites in this while still being calorie free, but still - yuck. I think my favorite part of the list is the end: potassium sorbate (to preserve freshness). Because really, there isn't much of anything in this jar that could possibly go bad. It's almost all chemicals. Lesson learned. 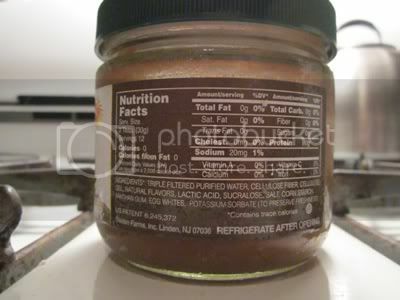 I'd rather have one spoonful of good caramel a year than unlimited access to this junk for the rest of my life! What about you? In a dream world where you could remove all calories but still preserve the quality, what food would you want transformed? Oh... just one food!? How to choose. Now, that's insane. I didn't even realize calorie free food existed! Great post Mary. You're right, it was another good reinforcement that when things sound too good to be true, they are. In my dream world, cheesecake would have no calories and also have some agent that helped boost your metabolism at the same time. Yum! As a Southern cook, this is something I face a lot. I know that I astound my MIL with all the sugar, butter, etc that I cook with. She makes everything either low fat or low carb (I think) and she always cuts the sugar down in recipes. I would definitely rather eat a smaller portion and have it be it's full self than try and cheat the recipe. I'd also rather work out a little harder than cut the flavor. I wish that I could make my favorite treats (chicken fried steak, coconut shrimp, and biscuit pudding with hard sauce) healthy and low in calories and fat. But I can't. And I'd rather eat them the way they are, as a treat, then turn them into something less tasty. Hmmm tough call - probably french fries and gravy. My one true weakness in life. Why are things like that always too good to be true? I agree with you there though - always go for the real stuff in moderation over the chemically processed crap, it may be less calories but it makes you feel like processed crap and takes your body a lot longer to break down and use. But I agree.. calorie free= full of fake.. yuck! If you look at the label it says there ARE trace calories if you have more than one serving as most people do :) Same idea as the "can't believe it's not butter" spray....and crystal light, diet coke, etc. for that matter. There are some things that I like better that are made as lower fat. They are usually dairy based products. (milk, cream cheese, dressing etc) The non-fat stuff I can not stand. I do use the fake drink mixes and diet coke. I just do not like to drink my calories. I know water is better for me, but I do not like water much. Caramel or Cheesecake would be my dream no-calorie item. You are brave to even have purchased this to try. I would have laughed at it the store and moved on. Preserving freshness - what a laugh. 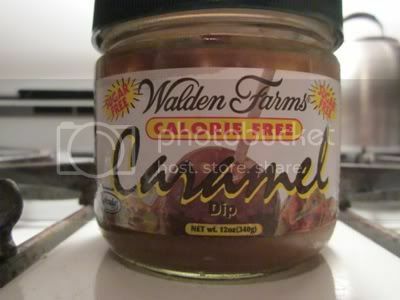 In my experimenting with diet foods, I tried several Walden Farms items--jars and bottles of toppings and dressings. HORRIBLE. Every single one was AWFUL. I am astounded the company stays in business. Maybe people on low-carb are desperate for anything remotely like X or Y...but I'm with you. I'd rather plan for rare but REAL treats than eat chemically-tasting, bad-tasting horrors of Frankenfoods. Ugh. Wow. Excited for a moment. Thanks for the review. I would of bought this on sight. I would love to have a calorie-free spaghetti Bolognese. I have to say I like a few of this reduced fat and sugar stuff. But I always check twice if the fat is not replaced with sugar or the sugar with fat. But stuff like "Quark" has to be low fat because otherwise it tastes to buttery. 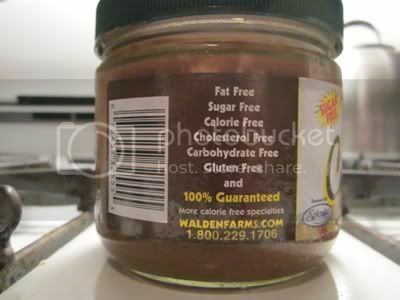 I too have been roped in my Walden Farms "free" labeling. I have no idea what I was thinking when I bought Bacon Dressing. Bacon is really a free food? Please brain work before the stomach gets involved.